These photos on Chris Jordan’s website show the effect of man’s waste on birds over 2000 miles from any continent. After the rather early date last year, Horwich RMI Bonfire will be held this year on Sunday 8th November. While going through some older photos, I came across this one that I had taken in the Science Museum of two calculators I remember from my childhood. The Sinclair model on the left was the first calculator I ever saw as my Dad had one. It had an LED display and the buttons made a distinctive ‘click’. It had a while plastic hard case which flipped open. 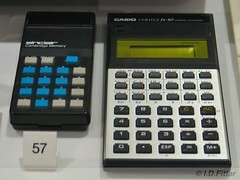 The other, the Casio FX-80, was ‘almost’ the calculator I used throughout secondary school (mine was an FX-81). It certainly makes you feel older when you see things like this in a museum.